Jamaican patties are an integral part of the Jamaican culture. Patties are to the Jamaican culture what hamburgers are to the North American culture. Patties are such a part of the culture that they are the standard lunch fare for Jamaican children. Jamaican adults, too, often enjoy two patties, a coco bread, and a "box juice" for lunch. At Sam's, we sell more than just Jamaican "Beef Patties". 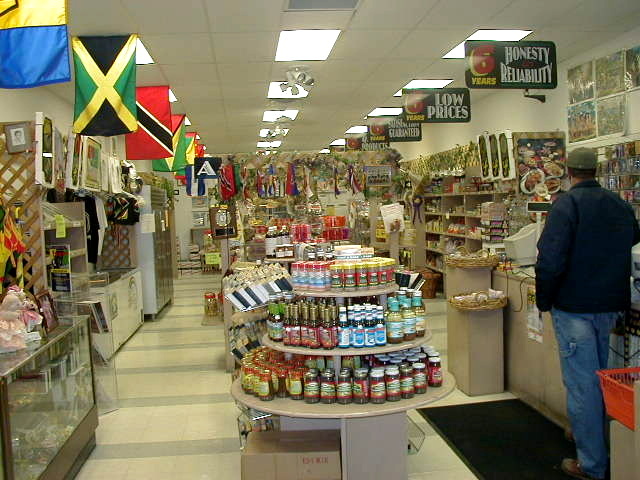 Sam's Caribbean Marketplace offers a choice of thirteen mouthwatering fillings in our delightful Jamaican Patties. Choose from six variations of delectable Jamaican-style Beef Patties and Meat loaves, two flavours of Jamaican-style Chicken Patties, Jamaican Callaloo Patties, mixed Vegetable Patties, Shrimp Patties, and our two recent exotic additions: Soya Patties and Jerk Fish Patties. Obviously, we take this Jamaican food seriously. Golden Krust Jamaican Patties or Royal Caribbean Jamaican Patties? Golden Krust Jamaican Beef Patties--Mild, Golden Krust Jamaican Beef Patties--spicy, Golden Krust Jamaican Curry Chicken Patties, Golden Krust Jamaican Jerk Chicken Patties, Golden Krust Jamaican Vegetable Patties, and Golden Krust Jamaican Shrimp Patties. Royal Caribbean Bakery Jamaican Beef Patties--Mild, Royal Caribbean Bakery Jamaican Beef Patties--Spicy, Royal Caribbean Bakery Jamaican Soya Patties, Royal Caribbean Jerk Chicken Patties, Royal Caribbean Bakery Jamaican Meatloaf Turnovers, and Royal Caribbean Spinach patties..
Jamaican Patties must be kept frozen. That's why we take great pains in shipping these Jamaican food products to you. NEVER THAW JAMAICAN PATTIES BEFORE BAKING! You may choose to purchase either UNBAKED or BAKED Jamaican Patties. Whichever you select, please be assured that the food filling is cooked to perfection before it is enveloped into the patty crust. "Unbaked" refers only to the outer part of the Jamaican Patty. Preheat oven 350F Degrees. Place Jamaican Patties on a baking sheets. Make sure that Jamaican Patties do not touch or overlap each other. Bake for 30-40 minutes, or until crust is firm on both sides. Allow patties to cool, and enjoy this most tasty Jamaican food. Preheat oven 350F Degrees. Place Jamaican Patties on a baking sheets. Bake for 15-20 minutes. Allow patties to cool, and enjoy this delicious and satisfying Jamaican food. Order our Jamaican patties by the dozens. Once you've tried one of these Jamaica food specialties, you'll want another, and another. Your children will love them, too. Best of all, order our JAMAICAN COCKTAIL PATTIES (miniature patties) and surprise your friends by serving mouthwatering Jamaican food at your next house-party or office-party. Now you can enjoy a bit of the Jamaican culture right here in the USA. Click here for an interesting New York Times article on Jamaican beef patties. Tell your facebook friends about Sam's. Share your thoughts in real time by adding your comments below. You may also CLICK HERE to become a fan of www.sams247.com on Facebook. Had a Jamaican Patty and Coco Bread Lately? Note: When checking out, please choose one of the following shipping methods: 1. FEDEX OVERNIGHT or 2. FEDEX 2DAY AIR Customers who live in the following states MAY choose "Fedex Home Delivery" and pay an additional $15 to cover the cost of the dry ice and the insulated box: NY, NJ, CT, PA, DE, MA, ME, VT, OH, VA, WV, or MI. Because of the additional $15 charge on ground shipping, that method may not be the most economical shipping method in all cases.. HINT: To minimize shipping costs, consider ordering non-perishable items separately from your patties. That way, you can choose less costly "Ground Shipping" for the non-perishables.